This is a highly recommended H2H style top, comfortable, soft skin friendly, and relaxed silhouette. Good of brand H2H process high quality fabric and fine workmanship. Provides the finest and most stylish shawl cardigan which can be worn during autumn and winter season to keep you warm. Style Tips : To make it more laid-back outfit, replace a collar shirt with T-shirt or V-neck tee. Occasion : Casual Attire, Dressy and Business Casual, Semi Formal. 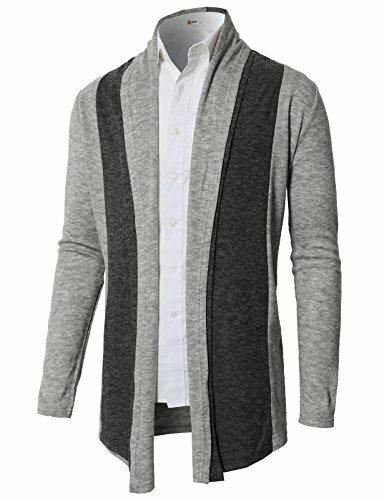 Super soft & lightweight knitted fabric, thermal, snug fit, long sleeve, high-low hem, color contrast shawl collar no button Cardigan. To make it more laid-back outfit, replace a collar shirt with T-shirt or V-neck tee.